Different types of construction have different level of tolerance against settlement. For example, buildings having wood frame including wood siding will have more tolerance than unreinforced masonry buildings. In dwelling house, even a tiny crack is considered unacceptable; on the other hand, in a structure used as warehouse, storage or industrial purposes, a large crack may be even not noticed. When sensitive finishing is provided into a building, like tile, a small cracks or movement will provided visual disturbance. When a structure is designed as rigid body, a settlement of a particular footing under any portion of it relative to other footings, will not result significant affect as some load will be transferred to nearby footing. In case of flexible structure, settlement of any footing is significant as movement occur before any considerable transfer of load to nearby footings, which indicates that a rigid structure will not subjected to significant differential settlement relative to flexible one. Coduto also interestingly concluded settlement that in most case structures, particularly buildings, settlement is governed by serviceability and aesthetic requirements not by structural. Visual hazard like jamming doors-windows, cracks and other identical problems appears first long before structural integrity is hampered. Cracking in load bearing walls of bricks or brick partition walls in buildings frame is generally occur when foundation is subjected to angular distortion more than 1/300. Structural damage in beams and columns is generally occur when foundation is suffered angular distortion more than 1/150. •They have provided a correlation, Δ = 350δ/L [where Δ = maximum differential settlement measured in inches and δ/L = maximum angular distortion]. 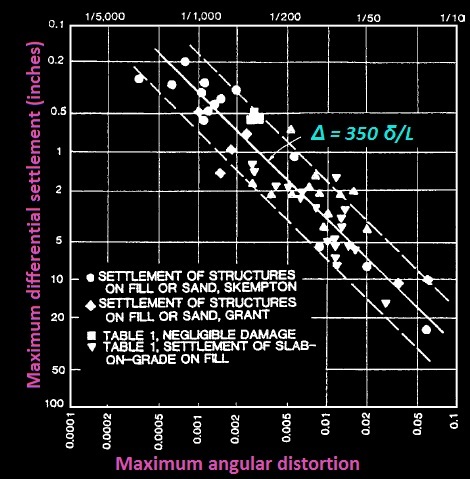 This correlation has derived by establishing a plot for maximum angular distortion versus maximum differential settlement as shown in above figure. For maximum angular distortion of 1/300 (δ/L), in a frame building cracking in brick panels or in brick wall of load bearing building will occur at maximum differential settlement (Δ) of 32 mm (1.25 inches). 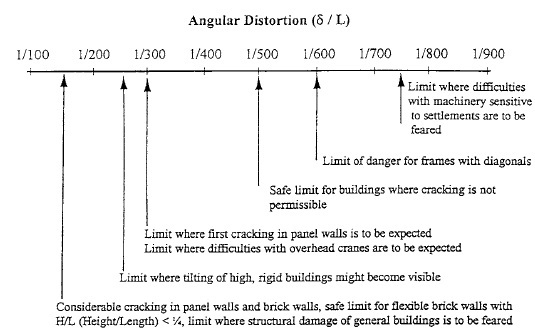 The limiting values of angular distortion to open cracks (1/150 and 1/300) mentioned above were provided based on observation of load bearing structure and reinforced concrete and steel frame buildings have traditional brick panels as partition or peripheral walls, but not having diagonal bracing. These criteria can be taken as mere guide for regular construction work of typical foundation of such buildings; but in some cases suppressed by aesthetic or for other considerations. Slab-on-grade foundations with light reinforcement have been included in above figure with other types of frames. The study shows that wall panels of gypsum board may be cracked at an angular distortion more than 1/300 (Day in 1994). Surprisingly the value of angular distortion 1/300 seems to be applicable both brick panels and gypsum wall panels supported by wood frame. The relationship, Δ = 350δ/L can be used in buildings supported on slab-on-grade foundation reinforced lightly as shown in above figure. 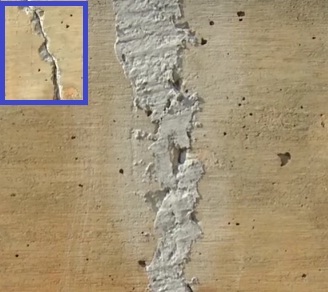 Using limiting value δ/L as 1/300 when cracks opens in panels of residential building having wood-frame supported on concrete slab-on-grade, the estimated differentiation displacement of slab is found 32 mm (1.25 inches); that means when maximum differential settlement exceeds 32 mm, such type of wall panels supported on described foundation become cracked. Same correlation has also been established by grant et al. ; but cracks are expressed as damage. He used a term rate of settlement which defines very rapid or very slow settlement. The available data studied in this research, showed that maximum angular distortion (δ/L) corresponding to damage of buildings found to be same for that cases of fast or slow settlements. Following figure shows values of angular distortion and respective type of damage (damage in wall panels and structure) provided by Bjerrum in 1963. This provides identical values of δ/L values as specified by Skempton and Macdonald and later Grant et al. the addition information offer by this figure is about threshold value of maximum angular distortion for buildings that have overhead cranes and sensitive machinery. Differential settlement of foundation must be checked unless building founded on solid rock. Differential settlement of 20 mm (3/4 inch) or less has been used as general guide to design foundation. Probably this limiting value is based on Terzaghi’s observation. Terzaghi has studied several European buildings in 1938 from which he summarized settlement more than 25 mm (1 inch) were resulted all building to be cracked. But buildings having wall length varying for 12 m (40 feet) to 30 m (100 ft) were not cracked. when differential settlement were equal or below 20 cm (3/4 inch). This allowable displacement values indicates that a more flexible structure like general steel framed buildings or building having significantly rigid foundations like raft foundations are capable to sustain larger differential movement and total settlement as well. For structures supported on load bearing wall, the maximum settlement values are (2.5-5) cm. for chimneys, silos, mats this value lies in between (8-30) cm, for framed structure (5-10) cm. All type of structures discussed above may be subjected to non-uniform settlement. Other limiting factor like considering drainage, the maximum settlement should be 15-30 cm and considering access (30-60) cm. Where L= difference between two adjacent columns that have settlement differently or any points that have subjected to differential settlement. Here Sowers provided higher values for regular settlement or more tolerant buildings and lower values stated for critical structure and for nonuniform settlement. A summary of foundation damage category based on crack width, maximum differential settlement and maximum angular distortion were presenter by Burland et al. in 1977 which was later supported and refined by Boone, 1996 and Day, 1998. In the previous section we have provided limiting values of different types of settlement, exceeding which crack opens in different component of buildings of different types. Here we are providing information about cracking width and resulting foundation damage.The relation between differential settlement and angular distortion was also based on the expression, Δ = 350δ/L. In determining severity of foundation damage of an existing building, the category may be influenced by many factors which include crack width, maximum distortion and differential settlement. When basis of damage category is only single parameter like width of cracks, it may be erroneous as there may have patch or hidden cracks or when secondary or non-relevant factors like shrinkage cracking results opening of cracks. 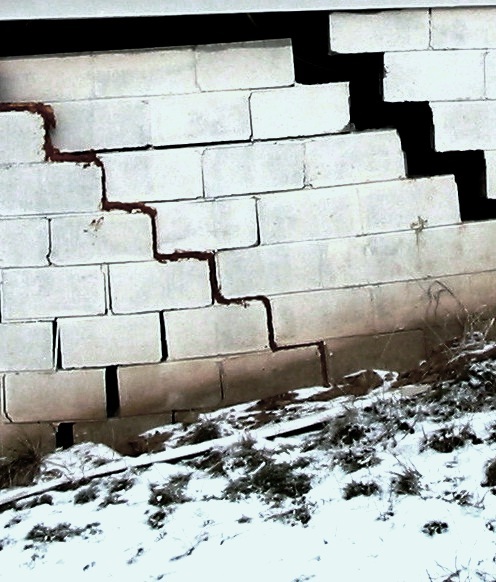 As an example, cracks in walls may be even not noticed under wall paper, which is only visible when crack reappear after additional foundation settlement.